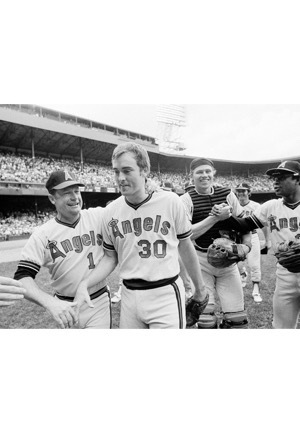 Nolan Ryan had a historic season in 1973. Ryan broke the single season strikeout record by striking out 383 batters, a record that still stands today. 1973 was the first year of the designated hitter, making Ryan's strike out record that much more impressive. He also threw two no-hitters during the season, both on the road. The first came on May 15th against the Kansas City Royals at Royals Stadium and the second on July 15th against the Detroit Tigers at Tiger Stadium. 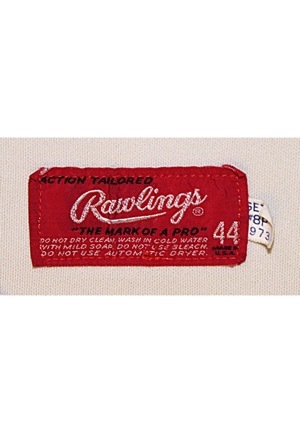 On the front right tail is the Rawlings manufacturer’s tag size “44” with washing instructions. Attached is a flag tag reading “SET 1 #8P 1973”. 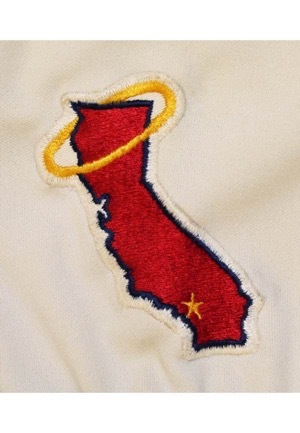 On the left sleeve is an Angels team logo patch depicting California. Across the chest reads “Angels” in red on navy blue tackle twill with the halo above the “A” in yellow on navy blue tackle twill. 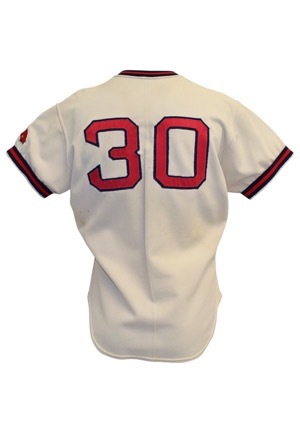 Adjacent below and on the back is the player number “30” done in red on navy blue tackle twill. 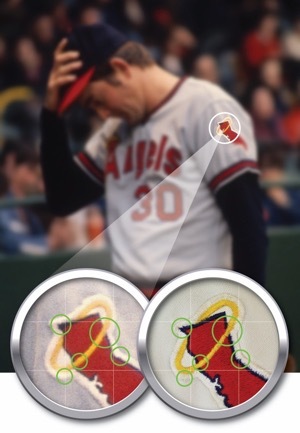 There is a repair on the v-neck of the collar. 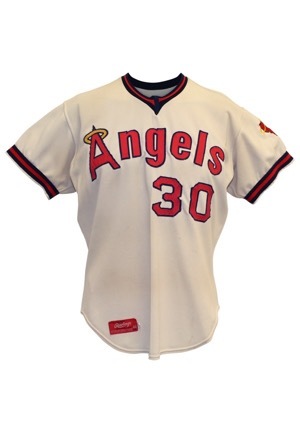 The jersey’s grey color has faded due to excessive laundering and wear. 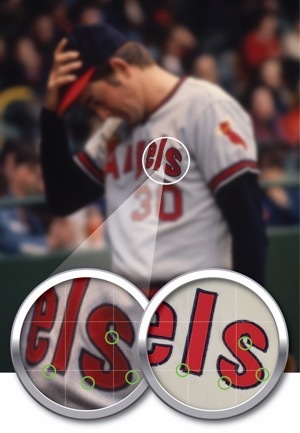 The California Angels wore multiple manufacturer’s in the 1973 season with easily apparent differences. 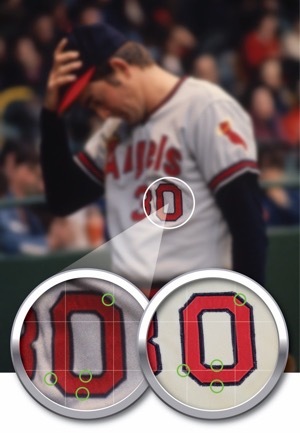 In Ryan’s no-hitter on July 15th, in game photography shows that he is wearing a Rawlings jersey walking off the field. 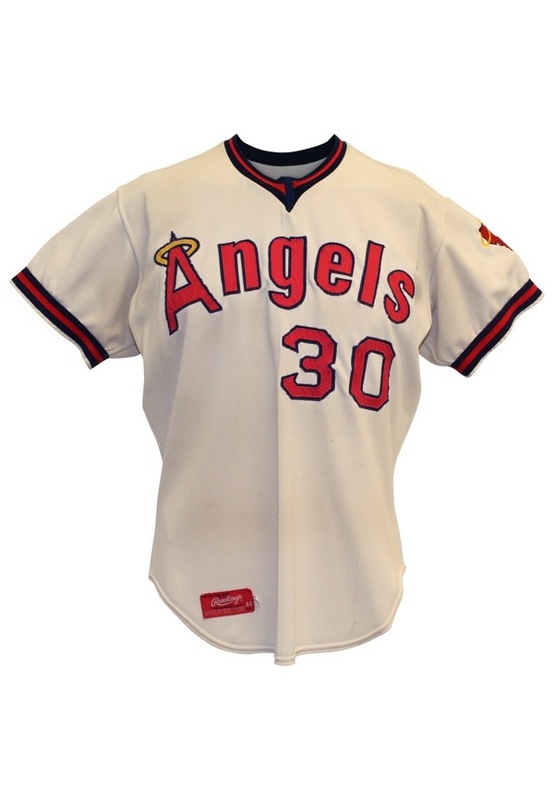 This jersey is properly tagged, was presented to us as game-used and in our opinion shows outstanding use. 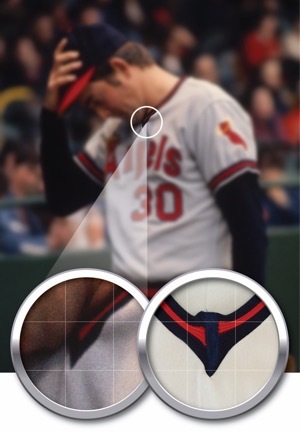 Accompanied by a LOA from Photo-Match.com grading the jersey a 9 and confirming the photo-match.